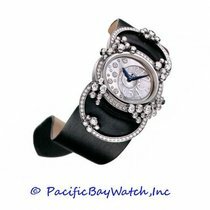 Additional Information: Brand new Audemars Piguet Millenary woman's watch, Model # 79382BC.ZZ.9186BC.01. 18kt white gold 25mm x 28mm case with diamonds with 18k white gold crown. 18k white gold fixed bezel with diamonds in a single row. White mother of pearl colored dial with diamonds and blued hands. Hours and minutes. Manual wind movement, AP Caliber 2046. 18k white gold bracelet with 856 diamonds and deploy clasp. Power reserve up to 40 hours. Water resistant to 20m or 60ft.